(Natural News) After suffering an allergic reaction to the controversial human papillomavirus (HPV) vaccine, Mia Blesky was left paralyzed from the neck down. Once a straight-A student and aspiring pop star who sang and danced, she’s now being home-schooled and given singing lessons at her bedside. The doctors say that it’s all in her head but her mother, Gini Blesky, believes that “the routine jab” is to blame. “The routine jab” is part of the childhood immunization program developed by the National Health Service (NHS), which Mia Blesky opted for back in September of last year. Shortly after undergoing her first dosage of Gardasil, the 12-year old complained about her legs feeling heavy and of a burning sensation in her spine. She was immediately rushed to the A&E at the Royal Berkshire Hospital by her concerned family. In the span of a few days, Mia Blesky lost all sensation in her legs; within weeks, her core body and arms followed, leaving her unable to do anything else except blink, speak, and sing. “When Mia was admitted to hospital, the doctors said it was a form of self-harm and she was doing it to herself. They discharged her after a few days. They gave her no treatment. We had to buy her a wheelchair. I had to carry her to the car. It has been absolutely awful, but the doctors say it’s psychological and down to bullying or sexuality issues, which is rubbish. The only thing they have offered to do is section her, ” Gini Blesky has told the DailyMail.co.uk. “Here we have yet another horrifying example of how the vaccine industry permanently damages young people and then blames them for their own suffering,” remarked Mike Adams, the Health Ranger, a frequent critic of the vaccine industry. 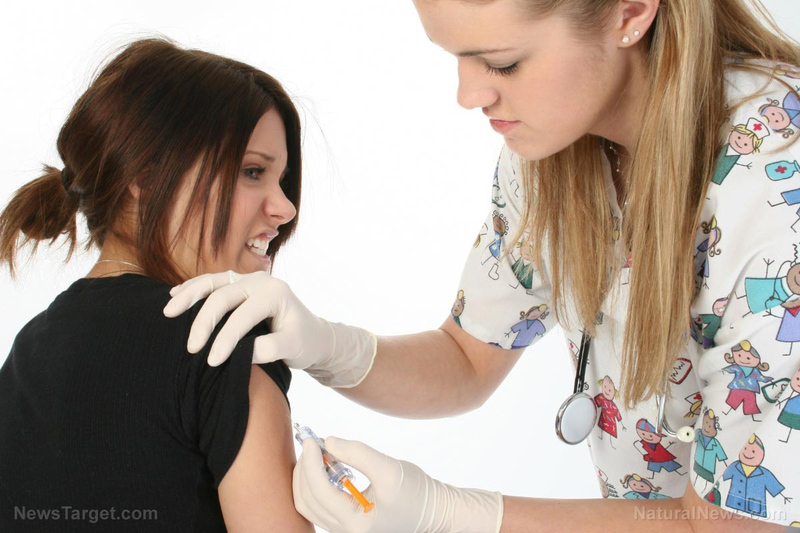 “Just like nearly all doctors who push vaccines, these doctors are clearly living in total denial of the extremely damaging effects vaccines often have on children and teens,” said Adams, who also writes for Natural News. Mia Blesky’s case is not a unique one. In 2014, Ruby Shallom underwent her third shot of Gardasil at her school. Within weeks, she began experiencing dizziness, stomach spasms, and fatigue. Two years after receiving her vaccination, she was unable to feel her legs. Shallom has since lost use of all but one limb. As part of their cervical cancer program, the NHS routinely offers Gardasil to 12- and 13-year old girls. The vaccine is intended to provide protection against two common types of HPV; however, reports have since poured in from women who claimed to have developed chronic fatigue syndrome because of the vaccine. In addition, the common side effects of Gardasil include fever, nausea, injection site redness, and pain in the arms, legs, or feet. In response to the rising number of cases, the UK Association for Vaccine Injured Daughters was formed. The organization represents more than 400 families, and have demanded for more research into the vaccine. Next : Were Neanderthals in California the first Americans?